"Django Unchained" is a western (more precisely, the Spaghetti Western) - a genre that has long since been forgotten. Perhaps Tarantino chose this genre because of the fact that noone did shoot fillms like this for a very long time. Did he win? Definitely not, because at some point the film turns into a typical Tarantino massacre. The movie takes place in America, shortly before the civil war. The hunter behind heads King Schultz redeems (read "draws") slave Django. He needs Django to help him with killing Speck Brothers who live on the same plantation where Django used to work. In exchange Schultz promises to help Django to rescue his wife Broomhilda. Quickly enough they find and kill Speck Brothers and more many other dangerous criminals. django rescues his wife and blows up the house using dynomite. And this is actually it. At which point did I realise that this is the most boring film I have ever seen? At the very beginning, when Schultz shot slave traders. 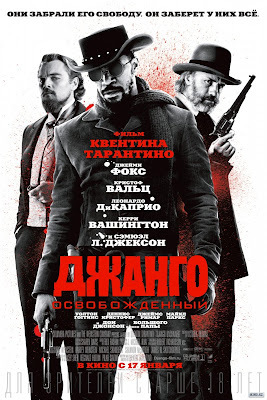 It became immediately clear that there is even more blood in man than ever and the "Django Unchained" is suspiciously similar to the one of the previous Quentin's work - "Kill Bill". Revenge and a lot of blood - typical Tarantino. Despite this, the film has already received 11 different awards, including ' best screenplay ', ' one of the ten best films of the year ', ' best dramatic film ', and it looks like it's not the end. And I really do not know either something is wrong with me or with various film-academies and critics. "They took his freedom away. He will take them all." I do not know how about all but he definitely took the time.